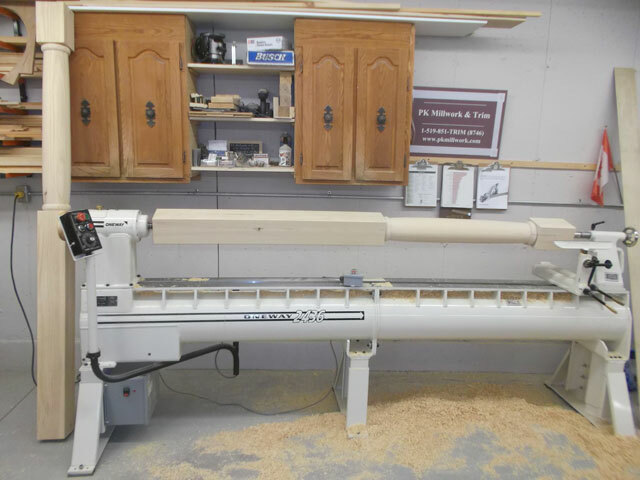 PK Millwork & Trim is a well equipped custom millwork and trim shop with several years experience re-creating Victorian & Heritage wood products. Our emphasis is reproducing Heritage millwork & trim and Victorian porch products for your home that are no longer available in stores. We can create a new design for you or work with you to duplicate your existing woodwork. 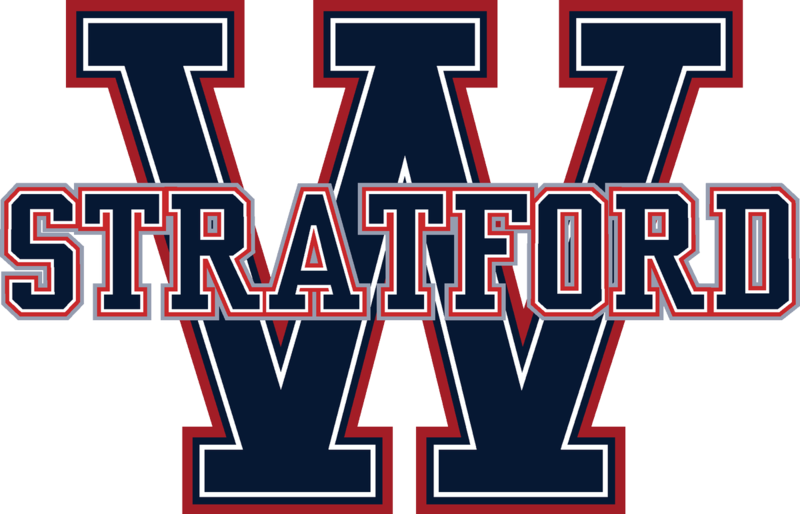 We are happy to discuss with you, any of your custom woodworking or millwork needs and look forward to working with you and your company. PK Millwork & Trim supplies home owners, renovators and contractors & home builders with quality, solid wood house trim, millwork and wood products. 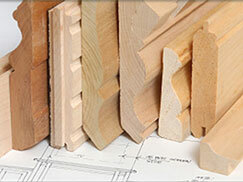 Our products include baseboards, door & window casings, door stop and beveled jamb sets. We turn casing corner rosettes and baseboard inside & outside corner blocks. We also machine header trim pieces, window sills and aprons. We manufacture plinth block mouldings, brick moulds & quarter round and have a variety of crown moulds and cove mouldings. We match existing profiles and if we don’t have the pattern you’re looking for, we can have new cutters shipped to us within two days. We are happy to make one short piece of trim or supply a house lot. We produce ellipse and curved window & door trim, matching an existing radius and profile. These are made in both high quality stain grade lumber as well as paint grade. We manufacture Victorian porch products that include top and bottom handrails, pregnant, or pot belly balusters, flat sawn balusters and square & turned spindles. We supply newel posts and columns as well. We can also match interior handrails and stair spindles. 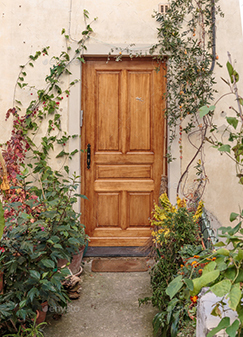 We also build interior and exterior doors, using full mortise and tenon joinery so that they are built to last. If you are renovating your old house, or building brand new, we would love to talk with you! Paul reproduced the millwork for our 1870’s farmhouse that was so perfectly done, it made us want to remove the remaining beat up original trim throughout the house to obtain the pristine look of his flawless work. Paul was able to reproduce our exceptionally intricate corner pieces for the window and doors, and deeply grooved casings. Our baseboards are huge and heavy, and look simply magnificent, executed in clear pine that are straight and true. His masterpiece is a large staircase handrail-the original was so hand-friendly we couldn’t bear to replace it with another configuration. Paul was able to match it. Our house was beautiful for my daughters wedding because of the lovely work he did, and done on time, too. So glad we found Paul! 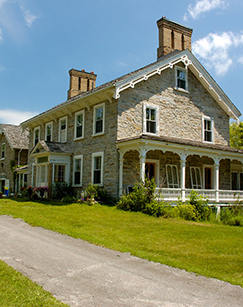 We spent 35 years restoring this house, and he made all the final embellishments for it. Thank you so much. Thanks so much for your service over the past few years, including several batches of reproduction turned spindles/balusters, reproduction casing, rosettes, and baseboard, and especially the built-up crown moulding you put together for us that perfectly matched an existing plaster crown. I know all my clients were thrilled with the results and the materials you provided played a key part in that success. Whenever a situation arises where a client needs something I can’t get off the shelf, I know I can rely on your expertise. Thanks again for your great products and the personal way you approach customer service, it’s noticed and appreciated. We were very pleased with Paul Jackson’s work. Paul is not only a perfectionist with an exacting eye for restoration detail, but also he was very pleasant to work with and his prices were reasonable, especially considering the quality of his work.He matched the old coves and gingerbread trim on our house and recreated bargeboard & a spire that had been long gone. Everything he did was perfect. As a custom Heritage millwork & trim shop, we reproduce all Victorian woodwork including Heritage mouldings for baseboard, door & window casings and exterior trim. We can match any existing profiles that are in your home. We have knives in stock that include the Heritage mouldings but also have colonial and contemporary patterns, and can have new knives made to your specifications. Our specialty is high quality, reproduction mouldings for renovations but we are happy to supply trim for new homes as well. 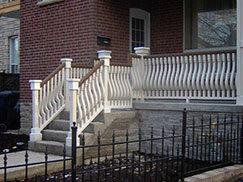 PK Millwork & Trim can custom turn your porch spindles, newel posts and columns. Victorian roof finials and spires can be turned to match existing originals. Stair spindles and interior woodturnings can also be duplicated. Table legs and chair spindles can be matched or we can create something new for you. A sample in hand is always the best but we can work from detailed drawings. PK Millwork & Trim can reproduce your old Victorian porch or verandah. We mill top and bottom handrails as well as pregnant balusters, pot belly balusters, flat sawn balusters, and square and turned spindles. We also supply square and turned newel posts and columns. We manufacture railings in straight lengths to suit your needs and can build curved handrails to fit any radius. We can match your existing profiles or use one of our templates. The bottom of the porch spindles and balusters have a notch to mate to the beveled bottom rail to allow water to run away to help your new railings to last longer. All of our porch products have eased edges and are sanded ready for priming. 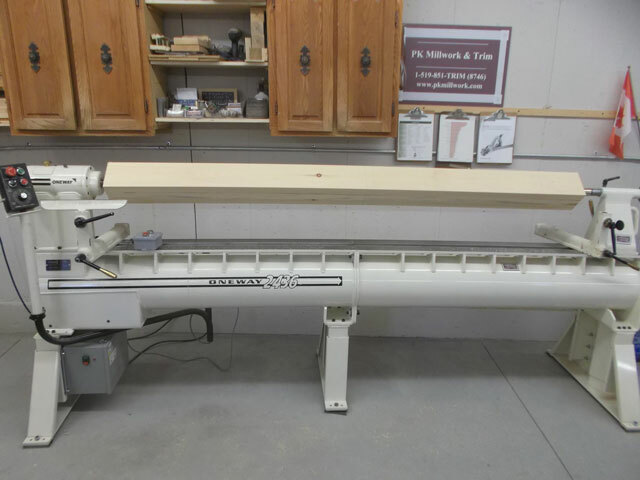 PK Millwork & Trim is a well equipped millwork and woodworking shop. We work with home owners & renovators as well as contractors to supply quality wood products for your home. 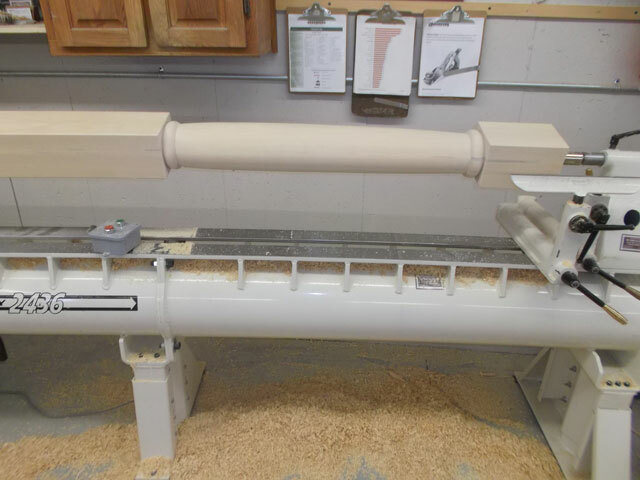 Our milling services include jointing & planing, drum sanding, building solid wood cabinet doors and interior & exterior entry doors, gluing solid wood panels, custom moulding and custom woodturning. We are pleased to talk with you about any of your woodworking needs. 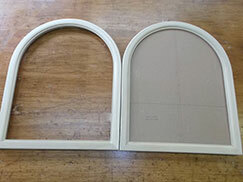 We manufacture ellipse and curved trim for round-top doors and windows. We can match any ellipse, radius and profile as well as width of casings. These are made in high quality stain grade and paint grade lumbers. We require an exact template for ellipses or details for a radius casing including the reveal, thickness and width of the trim. We stock and sell rough hardwood lumber in domestic species and have access to all the exotics. 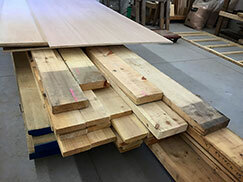 Maple, cherry and oak are always in stock in 4/4 to 8/4 thickness and other thickness are available, all in random length. We have veneered sheets goods and pine as well. Prices fluctuate, so please call for pricing and availability. We are happy to offer our milling services for you if needed.